To celebrate the grand opening of the Global Art School in Mitcham, parents are invited to take advantage of a FREE trial lesson this April (bookings are essential). Established in 1999, Global Art offers an exclusive range of creative art enrichment programmes for boys and girls aged 3 to 13 years around the world. These innovative programmes aim to inspire young children and help them learn, grow and develop creatively. Global Art programmes are now available in Melbourne at the recently opened school in Mitcham. 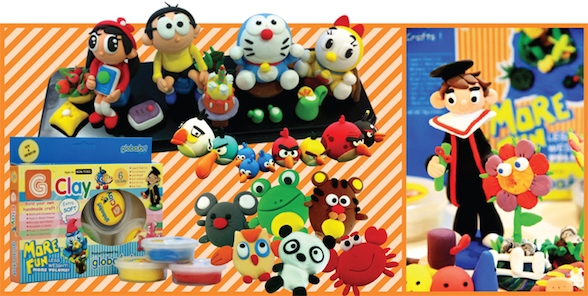 The friendly Global Art team offer a series of visual art and handicraft programmes, in particular Clay Art. Theses interactive programmes are held in a relaxed and supportive environment and are designed to bring out the natural creative talent in your child. Under the guidance of Global Art instructors, children will develop their artistic skills through experimentation of colours and composition. Bookings are now open for the Global Art courses; to take advantage of the FREE trial offer, please call Edmund on 04 3251 3344 or email edmund@globalartaustralia.com.au. For more information on this limited offer and what's on at Global Art, please visit the official Facebook website.